I used to work at Pup 'n Taco in high school ('75 - '77) on Lincoln Ave. in Anaheim. Funny, that graphic of the logo is from my blog site www.pupntaco.com! I loved pup and taco, when I was in high school, I used to frequent the one on Walker and Lincoln in Cypress. I miss it!! I used to frequent the pup 'n taco on Harbor Blvd in Costa Mesa. I always got the pastrami sandwich - it was really tasty and HUGE!! The fries were great, too. I too loved the crinkle cut french fries! I ate at the one at Clark and Los Coyotes Diagnol in Long Beach, CA. And of course they had the best hot dogs!! I miss it! I only knew of the Pup 'n Taco in Baldwin Park, about 15 miles east of L.A., where I grew up. I was only a kid (around 6-10 yrs old) but I remember loving Tacos on a Bun. I guess that was the actual name, that's what I called them at least. The last time I was in Baldwin Park, it had been replaced by a Taco Bell. Am I the only one who loved their hamburgers. OMG the chicken burrito. Good stuff. My P & T turned into a Taco Bell and still is. Lakewood, on Del Amo & Bellflower. A damn shame. Oh, good. Another Pup 'n Taco grape slush fan. I used to go to the Pup on Lincoln across from AHS. The pastrami was great, but their messy chili dogs were the best!! I remember the night i gave birth to my Son, my husband brought me 2 tacos and 2 chili dogs, (he didn't know what i wanted)and an order of fries, i thought i was in heaven after 22 hours of labor! My son just turned 30 and i sure miss those dogs!!! Love Pup N Taco. They had the best tacos and chili dogs. My elementary school would serve them on wednesday's. Your parents would have to sign a form and pay for them and every wednesday they would be delivered. That was a special day in school! Holy Crap!!! I thought I was the only one who remembered what Pup 'n' Taco was! This is great. Yes the tacos and the grape slush we used to go to the one on Clark and Los Coyotes Diag. after school. I worked at the Pup 'n' taco on Lincoln and Cypress. I think I was there from 1969-1971. Working there was a blast and the food we created for ourselves was amazing. Did you know that the "burgers" were called Texas Tomato Burgers and we did not cook them, they just floated around in a beef broth. We made all the rest, even the beans from scratch. Eagle Rock location on Colorado Blvd. My best buddie and I would walk down there on many a summer day. It was usually a toss-up whether to order a couple of chili dogs or the all-meat burrito. Of course, the cherry slush was a no-brainer. I loved pup n taco with the cherry and grape slushes! MMMMMM! The hot Dogs were the best too. So many good childhood memories there. We lived in Westminster calif. And we lived across the street from Pun Taco on Westminster ave. and Newland. Does anyone remember That one there? The fries were great too! Wow, what a good flashback. I worked at the Tarzana Pup N Taco. Still in contact with a couple of my fellow workers, Mark and Rick. Miss the great food and slushes. pup n taco on main st or on the corner of flower and 17th in santa ana best food how bout a cherry slush and a taco on a bun! PUP n TACO had the best Chili Dogs in the Universe !!!! They also had super tacos and pastrami sandwiches. The grape slushies were tasty too. If I had 3 wishes I'd bring back Pup n Taco with one of my wishes. I worked at the Pup 'n Taco at Harbor and Edinger in Fountain Valley/Santa Ana. I loved working there AND eating there. Cherry slushes were the best. Their fries couldn't be beat. They also had the best refried beans ever!! Made with lard and lots of salt just like they were suppose be made.I miss it...so sad. Mine was on Lemon and Commonwealth in Fullerton. I loved the grape slushy. We would stop in the summer after a day of swimming at Independence park. Westminster ave and Newland ave in Westminster... We would skateboard up and get tacos, fries and a grape slushi. Nothing could possibly compare. The other Westminster person, you lived in the apartments next to the Texaco station? I didn't know they were gone. Now my craving for a Texas Tomato Burger will nover be gone. I used to eat there (in Santa Ana) at leastonce per day. Everything they served was GREAT. Dan in Illinois. My mom and dad used to take my brother and I to the one on Vermont and 8th st in Los Angeles. I loved those fries and chili dogs. Yep, that's the one I went to. I remember Joe's liquor store. We usually went to the Pup at Magnolia & Edinger (also converted to a Taco Bell). Grape slush after a day at the beach. Great times! I went to FVHS from 77-81, and was one of the lunchtime PnT hangouts. Knew Joe Quintana too, shopping there since I was six. Tacos, Texas Tomato Burgers, Grape slushes, and the best chili dogs. Now Joes is gone, as is FV elementary (I went to Moiola, shrug), and PnT is a Taco Bell. So sad. But hey, they are bringing Bob's back. Thanks for the comment. Bob's is open in Orange now. We had a Pup N Taco is Mar Vista on the corner of Venice Blvd and Inglewood. Which was replaced by a Taco "Smell". I miss those pups and the fries were the best. I loved Pup N Taco. The fries were the best I have ever had. Does anyone know what kind of oil they used? I used to go to the one on Harbor and Edinger in Santa ana/Fountain Valley up until they closed around 1980. I worked at PNT at Los Coyotes (circa 1974) Diag with Neal,and Bob. Fay was the daytime Mgr. All was good what a party. Neal got me fired for should I say getting the money stolen. The Pup 'n Taco crew on Venice and Inglewood were absolutely amazing in the mid 70s. That shop did amazing business and they were wonderfully fast at getting their orders to their customers. I worked just down the street from that store and I would be a frequent customer. Five hot dogs or tacos for under a buck! Amazing memories of that place. Just to let you know, it might be coming back. my fave place growing up in the late 60's and early 70's.. Lake Ave, Pasadena CA... 'taco on a bun with cheese and pickles' and a cherry slush. lol ... FAVE!!!! Thanks for the comment. For now check out here. So eating a hot dog was like kissing a cow. 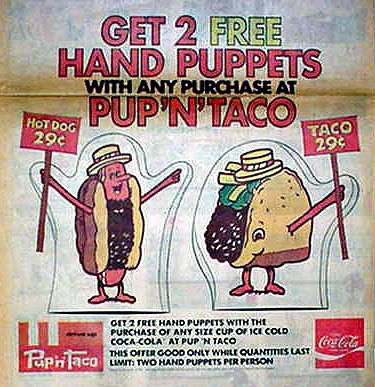 I was a huge fan of Pup "n" Taco when I was a kid. I ate at the one that was in Artesia, on the corner of South Street and Norwalk Blvd.I miss their great food, no matter what it was made of...it was great. They should bring it back with the same recipes as before. Nothing changed like low fat ...etc. I believe it's on a hiatus. I remember 10 for a dollar night at the Eagle Rock location on Little League night back in 1968. What great memories! Wow, we'll never see 10 for a dollar again. Thanks for the comment. I used to go to the Pup & Taco on Lincoln in Anaheim as a kid. My sister used to work there around 82-83. Did not know that they were all over the place. It was my favorite hot dog place. DerWiernerschnitzel a close 2nd close. Worked at the DerWiernerschnitel on lincoln just east of Euclid St. back in the mid 80s. They closed that one too to expand the 5 freeway. I miss those days. Grape slush to wash down a burrito with red sauce and crinkle cut french fries.